Nicchio Ristorante, Belmar, NJ - Closed. Well prepared, innovative Northern Italian menu. Pastas are made daily on the premises. Decor and ambience are attractive and energetic. Parking can be less than convenient during peak summer weekends. Noise Level: Moderate --- except when jazz entertainment is on Friday evenings or when seated in the back of the dining area next to one of the two booths with a large group party. Recommended For: Diners who enjoy well prepared northern Italian food in an attractive setting with full bar service. Not Recommended For: Diners who may prefer old world Italian dining with traditional red sauce southern Italian dishes. 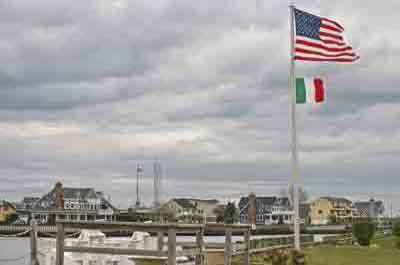 Opened in June, 2009, after many inconsistencies and a change in management, Nicchio Ristorante has now settled into being one of the top Italian restaurants in the Belmar, Jersey Shore area. The interior decor is very attractive with Italian accents and without the typical Italian statues or walls adorned with prints of Italian scenes. The centerpiece is a large, beautiful L shaped bar enjoyed by a vibrant young professional crowd. Several wide square columns are attractively done up with natural brick on the bottom half. Built in wine racks are neatly embedded in the walls and columns. Soft background music is played at the right level for ambience and enjoyable conservation. The restaurant is operated by owner Dan DiCesare and General Manager Christopher Pica with the kitchen under the direction of Executive Chef Eric Yegelwel, a graduate of the French Culinary Institute, who prepares a seasonally changing Tuscan style Italian menu. The servings are creatively prepared using fresh ingredients. Although the limited menu offers a few traditional Italian items, there uniqueness comes with their innovative Tuscan dishes and daily specials that separate the quality and type of food they serve from the many other mediocre Italian restaurants in the Belmar area. Service is very friendly, attentive and well trained. On occasion the friendly restaurant manager will stop by your table to ensure your dining experience has met your best expectations. The restaurant offers many fine dining amenities including tables set with white linen. Glasses of wine are served in a small glass size decanter with a portion of the decanter poured into your wine glass properly filled to less than half full to allow for breathing. Nicchio Ristorante offers patio, outdoor dining during the warmer months. On Friday evenings there is live, soft Jazz entertainment. Street parking is available and can be troublesome during the summer peak months. Discover the top Belmar restaurants with comprehensive ratings and reviews.